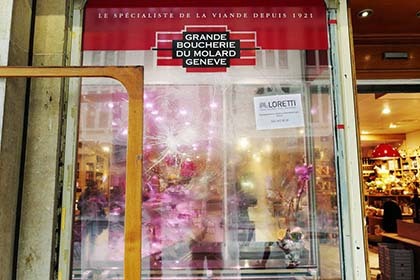 "Butcher shop windows were targeted on the night of the 12th of April. Smashing multiple targets including doors and with small bits of glass flying in all directions over the animal corpses, the media has reported a cost of about 15,000 Swiss francs (£11,000 approx) for the company. 'We want to create economic damage to the speciesist system and draw media attention on the movement to show that it is taking a more offensive form, especially if others get inspired by this and decided to join the fight.'"